Attention Brady BMP®21 Printer users: Your printer is obsolete! But there's a "plus" side to that news…The Brady BMP®21-PLUS. The new BMP21-PLUS offers increased durability, additional applications, smart automatic formatting with drop-in label cartridges, and a lower price. And for BMP21 users who still have label materials left, you'll be happy to know you can use them with the -PLUS model as well. MORE, MORE, MORE – HOW DO YOU LIKE IT, HOW DO YOU LIKE IT? 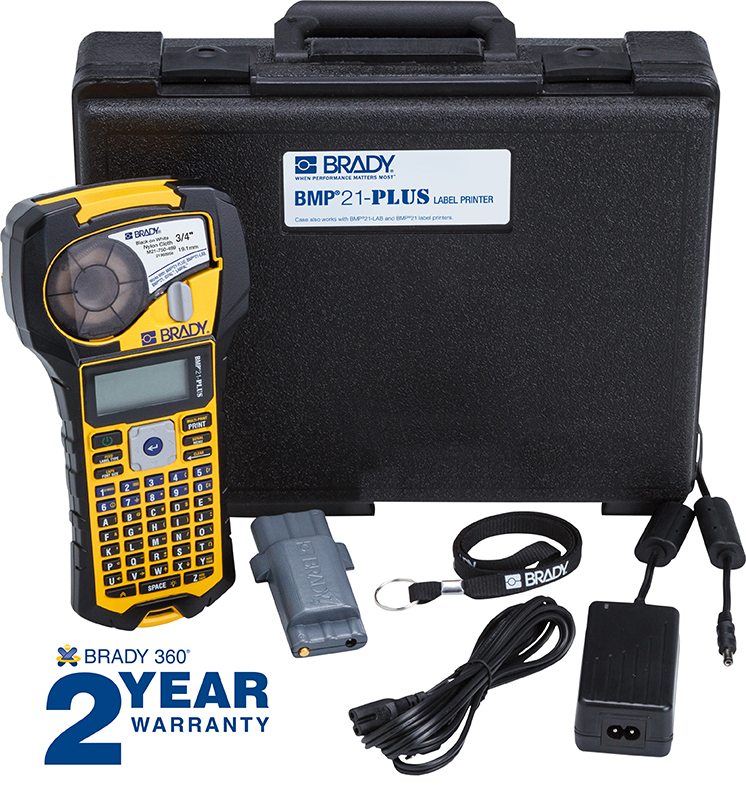 The BMP21-PLUS printer features beefed up protective bumpers/internal shock resistance, a new high-visibility color scheme, the ability to use the rechargeable Li-ION or AA batteries, a myriad of new applications, 100+ electric, smart home, safety, and datacom symbols; 24 new material parts, and a starting price under $100. If you're new to the market for a portable label printer, choosing the BMP21-PLUS is a no-brainer. Existing BMP21 users should also consider a -PLUS purchase to take advantage of the upgraded performance and new label materials. As mentioned, existing BMP21 M21 cartridges (46 currently available) will work with the new BMP21-PLUS (unless otherwise specified). In addition, there are 24 new M21 cartridges, including Self-Laminating Vinyl (for wire & cable), PermaSleeve Wire Markers (for wire & cable), Nylon Cloth (for flat, smooth surfaces/textured surfaces/wire & cable), Indoor/Outdoor Vinyl (for flat, smooth surfaces/textured surfaces/outdoor use/harsh environments), and Polyester (for flat, smooth surfaces) labels. These existing and new materials make the BMP21-PLUS Portable Label Printer a smart choice for a wide variety of labeling applications including: Electrical & Automation (wire & cable, terminal block strips, inside-panel components, front-of-panel, circuit breaker strip, outlets, and junction boxes), Datacomm & IT (data cable, cable flags, patch panel strips, data center equipment, faceplates, ports, and tools/storage), and Visual Workplace/Maintenance/Industrial (bins/shelves/drawers, equipment/machinery, safety equipment, lean 5S, panels/breakers). The rugged (passed shock and vibration testing per MIL-STD-810G Method 5.16.6 S4.6.5), fast (drop-lock-and-print materials), and versatile (tape widths 0.25" to 0.75") BMP21-PLUS offers a two-year warranty. 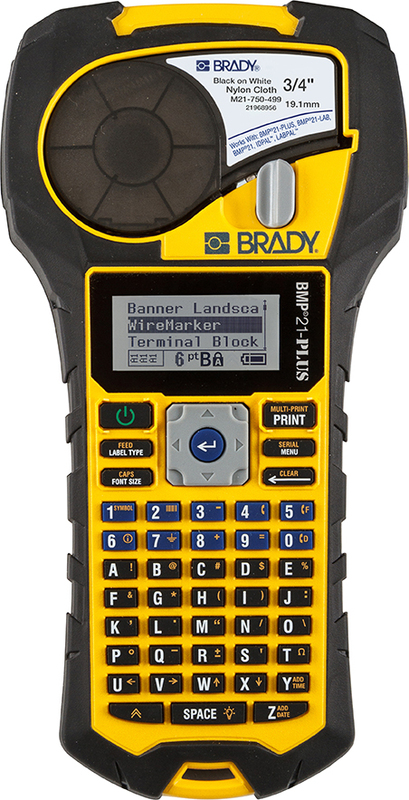 In addition to the stand-alone printer, kit, and 70 material choices, Brady also offers several accessories for use with the BMP21-PLUS (magnet attachment, multi-functional tool, AC power adapter, Li-ION battery pack, and hard case). To order your Brady BMP21-PLUS Portable Label Printer, accessories, or materials, please visit QSource.com. For questions, or additional info, contact us via phone (800-966-6020) or email.